Here are some pictures from the past week! We had some good “firsts” this week. One, Avery is getting up on all fours and rocking back and forth. Watch out people! 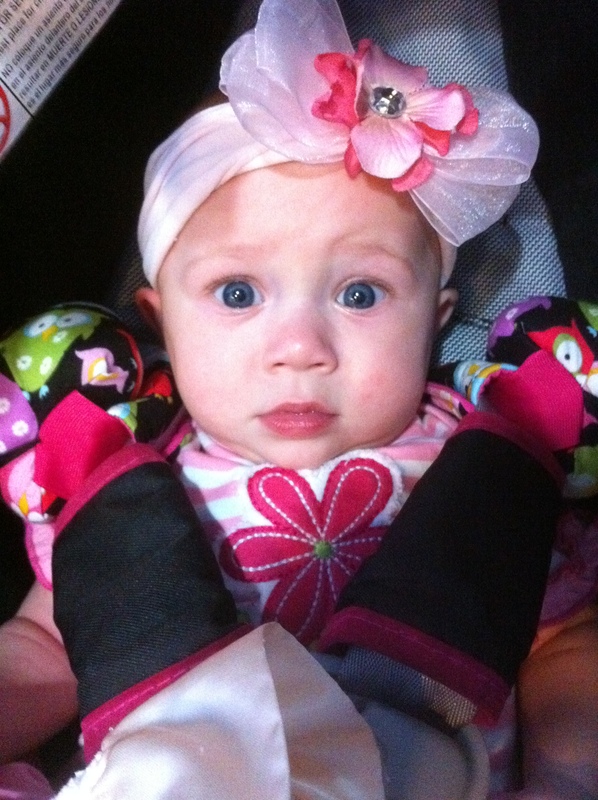 This girl is going to crawl soon I just know it! Another first was that the girls tried juice. White grape juice to be exact. They loved it. 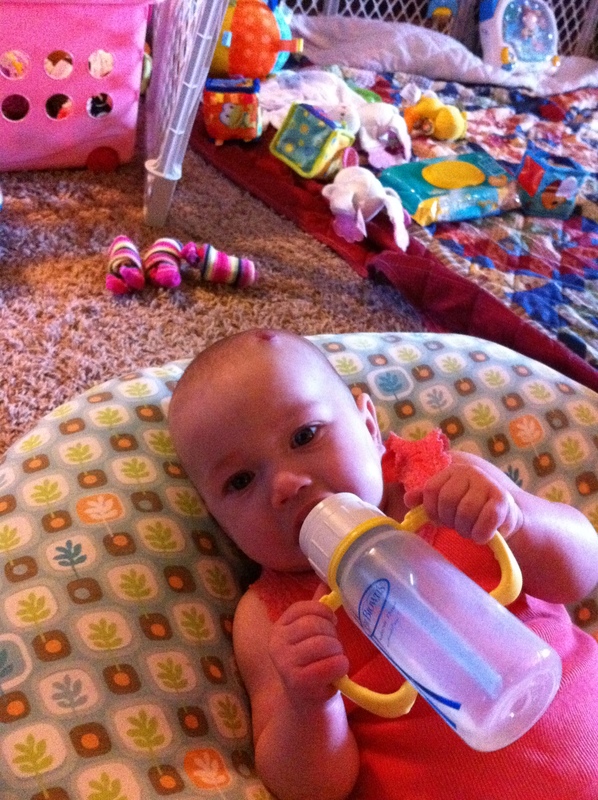 Avery, of course had to be independent and try to hold the bottle herself. Camdyn took her time to savor it and Emily was too distracted by all the wonderment around her that it takes her a while to finish it. We are battling little colds again, but at least this time we know what to do and we are all toughing it out. At least I can give a little Benadryl to help dry them out some and it makes them a little groggy so they rest more peacefully. They are such warriors! This week has been better overall besides the colds. As always, in the days of darks comes light and teaches you something new everyday. Praise be to God for that…Thank you to my dear friends and family who commented on my last post. I got responses I didn’t imagine or nor do I feel I deserve, I am just trying my best in this world 🙂 I appreciate the uplifting comments and prayers. We feel so blessed to have a wonderful support system that keeps us uplifting in God’s word, strength and overall support everyday. Much love! Some weeks are better than others even when you are not raising triplets. I have also learned that just because I am a mother now does not mean I still don’t care about things that I used to or things that were important before the girls came along. The interesting part is now figuring out a way to keep those things alive while raising three baby girls. This week, I just felt pulled. I felt emotionally drained and felt like the days would never end. I did get out and get my nails done, so that was nice. We also went to a wedding and to see relatives over the weekend, so I felt more human being out with the world. Some days I am a better version of myself and some days I would rather not say who I am…People around you know those days too well! At times, I start feeling like an introvert, a hermit, more comfortable just staying home. That is what concerns me at times. Before the girls, I was a “runner around-er.” With work (the corporate kind that is) and just doing the things I liked to do I was busy all the time. I did not start feeling slowed down until I was put on bed rest with the girls in January. Almost seven weeks of being trapped indoors in the snow was really hard. I can honestly say I was depressed. Superficial things, but important things to me, started to bother me like completing the girls nursery. Which to this day, is still not finished the way I dreamed. 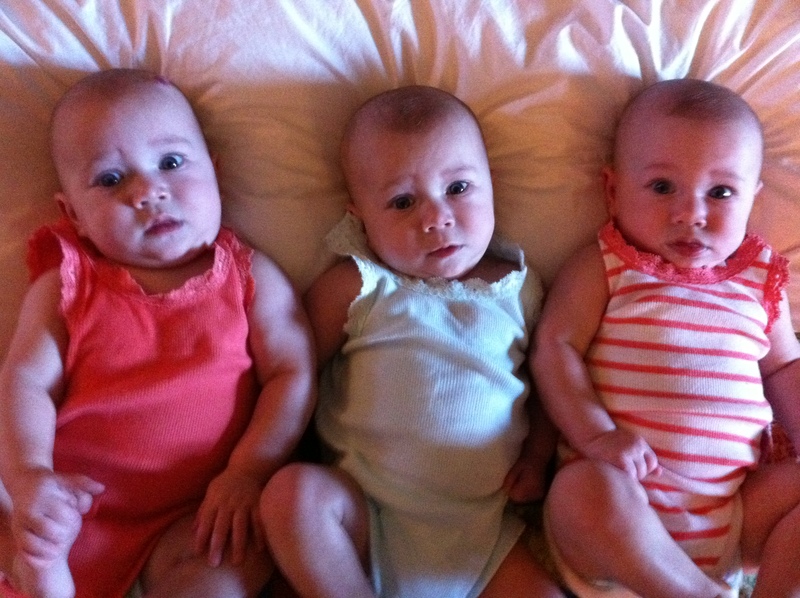 I know you may be saying, “That is not really important..you have three beautiful healthy girls..” And yes, you are right. I spent six more weeks visiting them every day at the hospital, putting life on hold with the unnatural feeling of not really being a mother because your babies are not home. But, I was suppose to feel grateful and uplifted that they are alive, well and will be home soon. I said to Bryan the other day when we were on the Turnpike, “Doesn’t it feel like forever ago that we drove up here to the hospital every day?” He agreed. We also agreed how hard that day was to leave them behind. How strong we were to let them grow and get better and go home alone. We finally brought them home and it was bliss, but so incredibly challenging. Relief that they are in are home turned to anxiety and panic about how to manage it all…everyday. Those anxieties subside but just get replaced with new worries. I think that is the nature of parenting…period. We had their pictures made just two weeks after they came home. Drove all the way to Norman with my mother and mother in law. We had been up all night the night before…It was a mess. But, we made it there. Then superficially again, I think about how I felt taken advantage of. The pictures were cute but less to be desired. I was so exhausted to say or do anything. Was not on my aggressive “A” game. If anyone knows about kids pics, they are so expensive and you will pay it because they are your first ever photos. Again, I was pulled emotionally and worried about things that should not matter. I think this week was hard because I was worried about how I would look for this wedding I was going to…All post-pregnancy women have concerned. You just don’t feel like yourself. I was just overwhelmed emotionally and physically with the girls, I was praying for other people in my life I was concerned about…When I was able to get out of the house and people would comment, “Didn’t it feel good to get out,”I didn’t really know how to think. Its like I was parolled or something, released back into the wild for the first time. What I am learning on this new journey is that struggle is inevitable. It is what makes us strong. It is what makes our character. It is what defines us. For the past year, I have attempted grace and tried to move forward with integrity to be a good example to others. But, I must be honest. The struggle is hard, the rewards are many and overall it does get richer everyday. Somedays you just fall hard and the next day you get right back up. You try to stand taller and walk closer to God. Somedays you feel closer to the Devil pulling at your heart trying to make you see all the bad instead of all the good. Only normal in my opinion. The key is to not linger in that place for too long. You are no good to anyone not even yourself in that place too long. I thought a lot this week about lessons I want to teach the girls. And the main one this past week is this…Struggle is inevitable, but don’t linger too long and don’t stray too far from God. Finding grace is a beautiful thing. It is more beautiful than the room you never finished, the shopping you didn’t get to do, the night out with the girls you didn’t have, the nicer clothes you didn’t put on to be out in public (ladies you all have that supposed “athletic, grocery store look”-ball cap, gym shorts, tennis shoes, praying no one you know sees you). In grace you cherish patience and in patience you learn so much about the meaning of life. So, for the crummy week I had emotionally I say, “Thank You.” I feel better for it already. Side note: The girls are doing awesome! Rolling and laughing and they love to put toys, your nose, each other’s hands and feet and anything they can grab in their mouths. Still practicing with rice cereal but they are not too keen on the spoon. Still sleeping through the night for most nights which is so great. We are off the really expensive formula for two of the girls…YIPPEEEEE. Celebrate small victories! 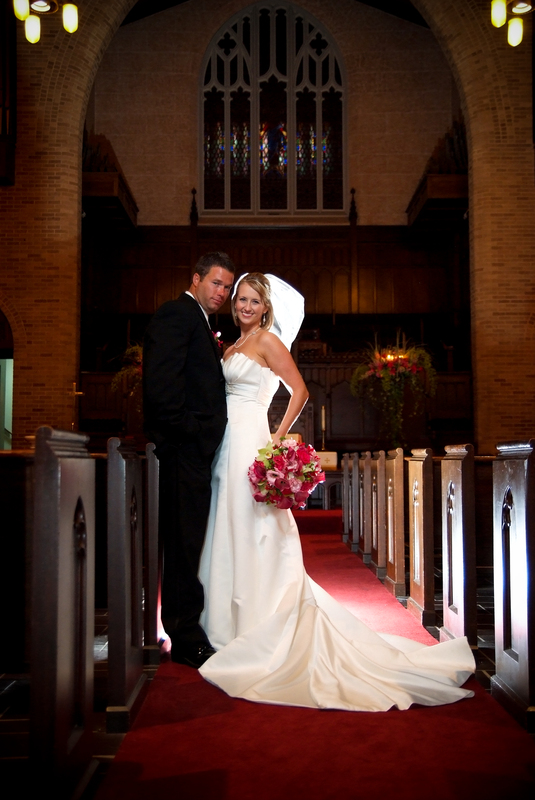 Just two short years ago, I married my best friend – my hubby. Our timeline is one that was defiantly chosen by God and the stars had to align all at the right time. I still feel that way to this day when I see how our life has unfolded. Some people may say, “How do you get three babies out of two years of marriage?” Hahahaha. Bryan and I started dating again about three and half years ago after a seven year hiatus. Friendship is what kept us together all those years apart and friendship is what makes our marriage work best in my opinion. We dated for about nine months and got engaged on my 30th birthday, planned a wedding in nine months, we were married for exactly one year…and then….we found out we were pregnant right before we took an anniversary trip to Las Vegas last summer. Of course, finding out we were pregnant was so exciting and such an awesome and memorable way to remember our first anniversary. It was August 27th of 2010 that we found out about the girls…all the girls 🙂 Seven and half months after that the girls were here. We have been tested both physically and emotionally through a lot in our relationship to this point. Sadly, there is a high divorce rate for couples with multiple. The stress and the challenges that it takes to raise babies like this I can see why couples face this…But, we have taken each challenge with strength, being partners and friends, and always remembering to laugh in between. Bryan is truly the first blessing in my life’s journey that I thank God for all the time. I cannot think of another man who I would be on this path with in my life. Last night, we went to dinner to celebrate early for our anniversary. We had a wonderful meal, a glass of wine or two and dessert. We also had drinks with friends who were dining at the same time. It was quiet and peaceful and….we missed our babies. We talked about our babies and we even look through pictures on our phone of what our lives looked like just six months ago and how far we have come with the girls. I think we both felt really proud talking about it and sharing with each other our dreams for their future. It was funny because after our meal it was only 7:45 p.m. and we said, “They are not even in bed yet, we can’t go home!” So we had another drink and visited with friends. When we got home they were sound asleep and slept ALL NIGHT! What a gift! But, the irony is that we tossed and turned all night. Maybe we were just out of routine. Happy Anniversary to my babies’ Daddy! On Friday, our babies will already be six months old! I cannot believe it. The past six months have been a roller coaster to say the least. Beginning in January on bed rest to February of their birth and the six weeks in the NICU….Month two, three, four, five and now approaching six. We have learned a lot, laughed a lot, cried ALOT, not slept alot and LOVED more than alot! The girls are at such a sweet age that I know it will just make our lives more rich everyday. I fall deeper in love with these like munchkins every morning I wake up. Bryan and I like to remind ourselves in the midst of how hard this is that they are so wonderful. Bryan says “They are awesome.” I would agree. 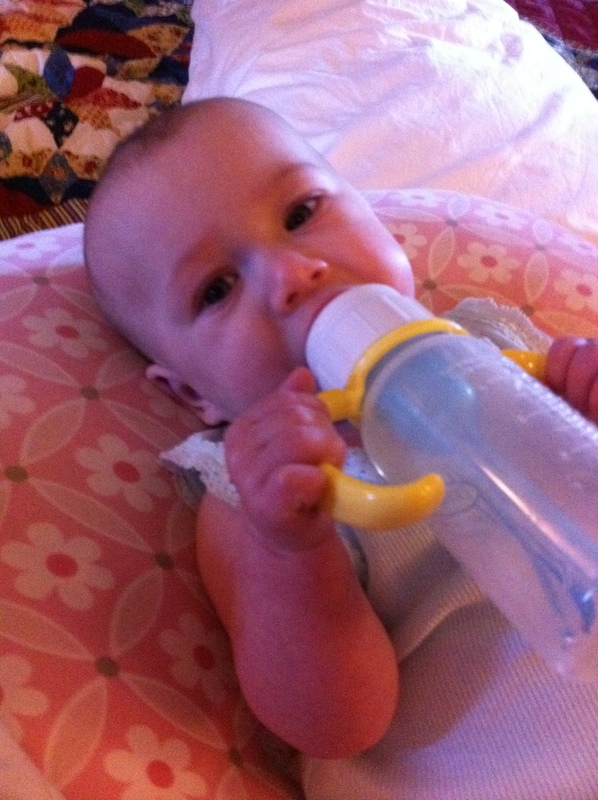 Avery – Current weight is 12 lbs 12 oz and 24 1/2 inches. Birth weight was 3 lbs, 7 oz. and 15 3/4 inches. Camdyn – Current is 12 lbs 5 oz. and 23 3/4 inches. Birth was 3 lbs, 2 oz. and 15 1/2 inches. 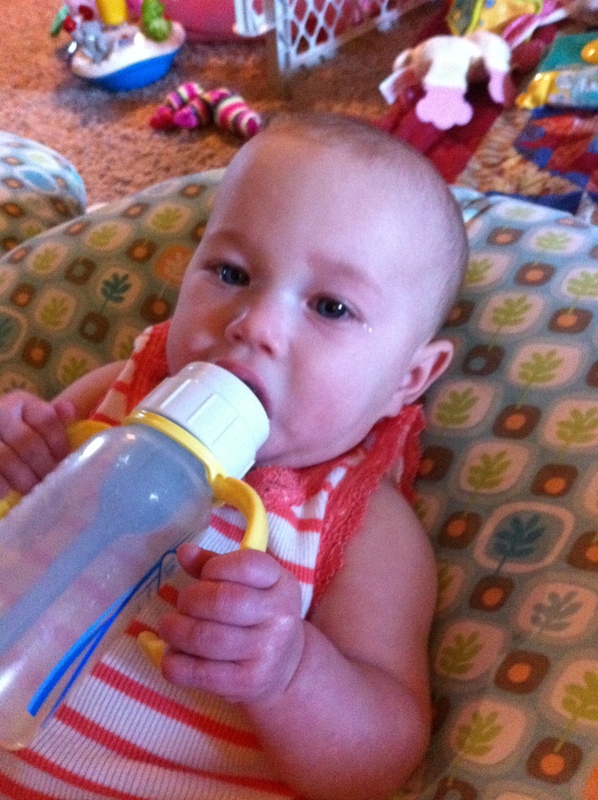 Emily – Current is 11 lbs 3 oz. and 24 inches. Birth was a wopping 2 lbs 11 oz and 15 inches. Speaking of the NICU, I was recently asked to be on a family support committee at Mercy. I think this will be an awesome experience to help other families with exactly what we went through. It would have been helpful to have someone to talk. 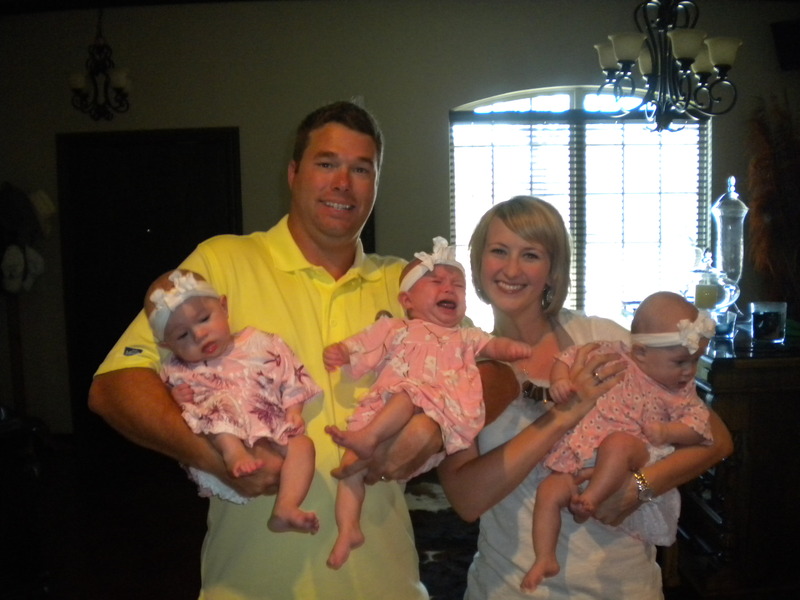 There is also a NICU reunion that we will attend with the girls in September. That should be a lot of fun to see the nurses and staff that took such great care of our babies. I don’t have much else to report right now. We are just trucking along with our growing and thriving family! Here are some recent pics I would like to share! Enjoy.